Effective in preventing most allergic reactions (like a stuffy nose), but because they cause drowsiness, the doctors hesitate to recommend them wholeheartedly. The panel prefers second-generation antihistamines, like Claritin, as a non-drowsy alternative. The panel loves these newer once-a-day products, whose active antihistamines don’t have the same sedating effects (although Zyrtec is considered low-sedating as opposed to non-sedating). These drugs and their prescription counterparts effectively work the same. Though not as enthusiastically recommended as the prescription versions (which tend to be better tolerated and last longer), the drops do curb itching. But, panel members say, they only work for four to six hours versus twelve for Optivar, so getting a prescription may be worth it. Although they help with clogged sinuses, they can also create unhealthy dependencies and carry possible cardiac and prostate side effects. Many on the panel prefer steroid nasal sprays, nasal-irrigation solutions (which wash away allergens), or antihistamines. Though the panel conceded the sprays’ effectiveness, they questioned if the anti-inflammatory action was on par with once-a-day prescription cousins like Nasonex. Plus the sprays may need to be applied three times daily, so they’re not always convenient. For airborne triggers like pollen, dust, and cat dander, nasal irrigation (a saltwater or saline solution) is great and couldn’t be cheaper. All you’re doing is rinsing the allergen from your passageways, so there’s no irritation or side effects (other than the weird feeling of water running where it normally shouldn’t). They can be helpful for short periods (say, three days or fewer), but bad for prolonged use. The drugs work by constricting the blood vessels in your nose, which can provide instant relief but also cause “rebound congestion,” meaning you get caught in a vicious spray-stuffy-spray-stuffy cycle. Much safer to stick to steroid sprays like Nasonex. Great marketing, but, according to the panel, not a great drug. Dr. Maitland believes there’s no proof that Airborne, sold as a general immunity booster, helps with allergies. The makers have provided little evidence that the mix of vitamins, herbal extracts, and minerals actually restores an immune system to health. Not a good idea for allergy maintenance. The echinacea plant is related to ragweed—meaning if you have allergies, it may actually make your symptoms worse. A panel favorite for stopping itching and treating dry eyes. 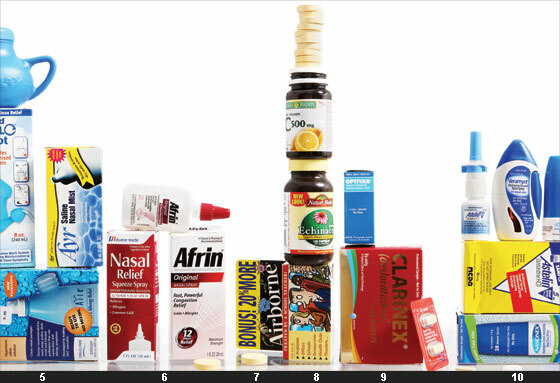 Though the over-the-counter drops work in the same general way, the prescription versions are more effective and last two to three times longer. They’re non-sedating, cover almost the entire spectrum of reactions, and don’t leave people feeling groggy. The over-the-counter generation 2 antihistamines are essentially the same; these drugs simply haven’t been approved by the FDA for over-the-counter use yet. Doctors absolutely love these. The spritzes (which you use once or twice a day) effectively bring down swelling, whether caused by allergies, infections, or irritants like pollution or secondhand smoke. They help control seasonal nasal allergies, work quickly (within half an hour), and can be used on an as-needed basis. The panel was a little hesitant to give a full endorsement, however, since they are newer and less known than the steroid sprays. 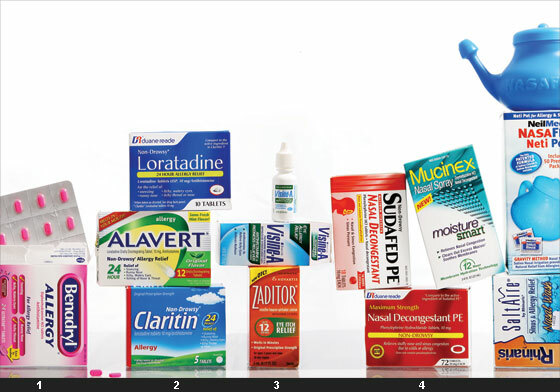 And what about generics?A $10 box of Rite Aid–brand Loratadine is the same as a $30 box of Claritin, right? Yes, in terms of the active ingredient. It’s the surrounding stuff that’s different (read cheaper). So while the drug may work the same way, it may taste different, dissolve more slowly, or slightly change the way your body reacts to it. Generally, the difference is immaterial. Dr. Jordan Josephson, nasal and endoscopic sinus surgeon at St. Luke’s-Roosevelt Hospital; Dr. Steven Lamm, allergy specialist and New York University clinical professor; Dr. Anne Maitland, clinical professor of allergy and immunology at Mount Sinai; Dr. Clifford Bassett, allergist-immunologist and assistant clinical professor of medicine affiliated with the Long Island College Hospital in Brooklyn; Fernando Gonzalez, pharmacist and supervisor for CVS pharmacies in New York.